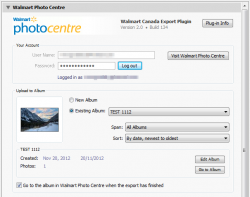 Added support for the backend changes recently implemented at Walmart Canada. Added the option to validate photo size on export. Now the plugin is compatible with Lightroom 4. NOTE: Starting with version 2.0 the plugin requires a registration fee of $10 to help offset the cost of development and support. Fixed the issue with logging in when using Lightroom 3.0 for Mac OS. Now debug logs for troubleshooting can be submitted directly from the plug-in. Added the ability to rename albums. Added the ability to navigate to the selected album in the web browser. Changed the version number format back to the classic form. Numerious cosmetic improvements and tweaks. The plug-in is now compatible with Lightroom 3.0. NOTE: Due to an internal issue in Lightroom 3.0 for Mac OS, the plug-in may still work incorrectly for Mac users. Now the plug-in is compatible with Lightroom 3 Beta. Now the plug-in correctly handles the situation when you attempt to export photos that exceed the 6MB size limit of Walmart. Thank you for creating this plug-in. Works well. One problem that I am having is when adding photos to an existing folder. It seems to upload the photo – and the cover page of the album will show the photo (if the album was empty), but the new pictures do not show up in the album. They show up properly when adding to a new album – even a new album with the same name as an existing album. I’ve tried logging out of wal-mart’s site and back in – but it didn’t appear. Just wanted to provide feedback. I am working around it and do not expect a response. Thank you. The thing I’ve noticed, sometimes there’s a delay before an uploaded image appears in the album. I’ve seen delays as long as 5 minutes. So far I can’t tell for certain if this can be avoided, but I will definitely look into this. Thanks for your feedback! I was wondering if the plugin has been updated for the full release of Lr3? Or will the Lr3 beta version sill work fine? I will be updating the plug-in tonight, you should be able to download the new version tomorrow morning. Would really like to see this plugin working again on Mac OS, any idea on what the issue is on the Mac and if your able to get it resolved ? The issue will be resolved when Lightroom 3.2 comes out. The plug-in is already working on Mac with Lightroom 3.2 Release Candidate, so if want you can get a copy at the Adobe Labs site. Any chance this plug in will be available for Wal Mart stores in the US? The last time I looked into this, Walmart US was very integration-unfriendly, so I dropped the idea. I am going to take another look, but it’s probably going to be a while before I have a definite answer. I use your Walmart Ca plug-in to get photos to my family in Canada with no shipping and no customs hassle – thanks! I was wondering if there is any chance of a Walmart US plug-in?